Mix the cream and vinegar, and set aside for 5-10 minutes. Beat with a handheld electric mixer the eggs, sugar & salt till white, fluffy and creamy. It took me about 4-5 minutes to get it a nice ‘white’ color and a good fluffy texture. Add oil and just mix it trough. Mix in mashed bananas and bicarbonate of soda. Add flour & baking powder, and hand mix. Pour in the cream and vinegar mixture, then add the chocolate chips and mix till well incorporated. Scoop with a 1/4 cup measure the mixture into lined muffin tins. Just for fun, I added some extra chocolate morsels on the dough for some decoration. Bake in preheated oven at 350F for 12-15 minutes, or until skewer inserted comes out clean. 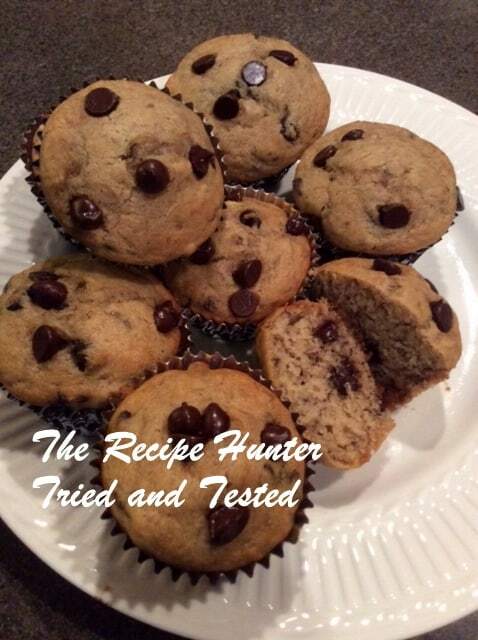 Note: The Recipe Hunter (Cook & Enjoy) : I am very very happy and surprised by the outcome of using the cream.